The Spector-Leahy bill to restore the right of habeas corpus to detainees has been defeated. An "aye" vote of 60 Senators was needed. The final tally was 56 to 43. The nay votes included 42 Republicans and Joe Lieberman. The roll call vote is here. What it means: Executive imprisonment without judicial review. 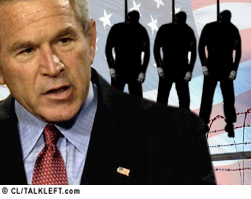 President Bush can continue to designate and detain individuals as "enemy combatants" and they have no meaningful ability to challenge their confinement. Sen. Patrick Leahy and Chris Dodd introduced a bill this week to restore habeas. Help them out. They need 60 votes tomorrow. Latest word is 55 Senators are on board so far, with key targets as Lugar, Hagel, Collins, Ben Nelson, and Joe Lieberman. If these are your Senators, pick up the phone and call. If you've got a blog, post and ask your readers to call. 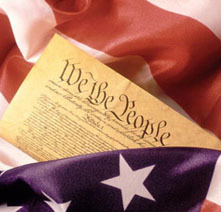 As Christy of Firedoglake says in her informative post, the Constitution needs your help today. Today is June Action Day (background here) on Capitol Hill. Thousands gathered in support of bills introduced to restore the right to habeas corpus, close Guantanamo and fix the broken military commissions system. A hearing on the bills begins at 2:00 pm (ET). 5. Close the detention center at Guantánamo Bay and give those held currently access to justice. Christy at Firedoglake provides the phone numbers for you to call. Today is the day to make yourself heard. 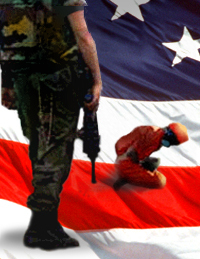 Two Views on Guantanamo: Which Is Yours? Tomorrow at 2:00 pm ET, the House Judiciary Subcommittee on the Constitution, Civil Rights, and Civil Liberties Oversight will hold a hearing on Habeas Corpus and Detentions at Guantanamo Bay. Morris D. Davis is the chief prosecutor in the Defense Department’s Office of Military Commissions. In the New York Times today, he provides what he believes to be a vigorous defense of the commission procedures. Many critics disapprove of the potential admissibility of evidence obtained by coercion and hearsay. Any statement by a person whose freedom is restrained by someone in a position of authority can be viewed as the product of some degree of coercion. Deciding how far is too far is the challenge. I make the final decision on the evidence the prosecution will introduce. The defense may challenge this evidence and the military judge decides whether it is admitted. If it is admitted, both sides can argue how much weight, if any, the evidence deserves. If a conviction results, the accused has the assistance of counsel in four stages of post-trial appellate review. These are clearly robust safeguards. The ACLU has launched a campaign to restore habeas corpus. In addition to traditional avenues such as lobbying Congress and arguing before courts, it's trying something new. ....a new online campaign built around the search for "Mr. Habeas Corpus" - unflagging champion of justice and due process of law. He's been looking out for us for years, now he needs us to look out for him. ....On October 17, 2006, he went missing without a trace. Last seen in Washington, D.C., his current whereabouts are unknown. Where is he? We don't know. But we do know Habeas Corpus needs our help. What can you do? Get involved and help us restore Habeas Corpus to his rightful place in our Constitution! The RSS feed is here. It provides code for a button to put on your own sites and is asking that My Space members make Mr. Habeas their friend. There's even a TalkLeft page on the site.